It’s been a bad week for the reputation of big business and its captains of industry.Â Trump and Fiorina, those shining examples of the species, lied their way through the debate, and Fiorina’s unremitting failure at business has started to attract appropriate attention.Â Trump’s incompetence as a businessman, and his lies about that, have not been sufficiently noted, despite this two-week-old analysis.Â Ehrenfreud notes that the passive-investment model doesn’t include living expenses. Fair enough: if he had put his money into an S&P index fund in 1978 and taken out walking-around money starting at $3m and ending at $16m a year, he would have $4b today.Â All his wheeling and dealing, and the money he took from sucker investors and lenders through his bankruptcies, didn’t even beat Harold Pollack’s index card. Neither of them can pass the Hyman Roth testÂ (“Your father [Vito Corleone] always made money for his partners”).Â Is this the best Republicans can put up as sound business leaders? Mark has pretty well toasted VW, but he neglected to mention the damage this piece of schweinerei has done to the market potential of diesels, the actually (not mislabeled-as) clean of which are an important element of reducing the global warming effect of transportation.Â I am not too surprised by this story, though no less outraged, because I remember the decades in which GM, DuPont and Standard Oil conspired to sicken and stupefy millions and millions of Americans because, while ethanol was a perfectly good octane enhancer, it couldn’t be patented. Making engines require tetraethyl lead to keep their valves from burning was like runaway slot machine for them.Â And we got a crime wave from it, to boot. I realize one reason I am simply beside myself about this is personal.Â I am a good non-partisan (at least I was before the Republicans became crazy and hateful) teacher; whatever students say, I try to make them think twice, consider another perspective and more facts, and like that.Â At Berkeley,Â part of my job is to stay somewhat to the right of my students. My Introduction to Policy Analysis course is beginning an economics unit, and in the usual way, we get into market failures starting from the virtues of the market when it works properly. These incompetents and criminals have put me in an especially difficult position for class Monday. At Berkeley, part of my job is to stay somewhat to the right of my students. Curious where this is on the spectrum "I don't know how to tell you kids this, but I have minor reservations about one of Marx's early works", or perhaps "The state should not own more than 99% of property in a society. Well, call it 99.5%"
A fine Stanford quip is brewing, but I fear it would offend your delicate Hoover Institution sensibilities, Humphreys. Well played Koehler, well played. So are your Stanford students still bringing "Tax cuts for the rich!" banners to football games? Now, now, girls. Keep your lacrosse sticks below the waist. I am a big fan of Cal. It serves an important social function: providing a place to attend to college if you want to live in the Bay Area but don't have the qualifications to get into Stanford. Those would be our 13,700 Pell grant recipients (37% of undergraduates), who lack the walletfication for Stanford (1100 Pell granters there, 16%), right? I'm a big fan of Stanford, which provides a place in my classroom for kids who are the first in their families to go to college, 20% the last time I polled a class. If it were bigger, and could take more of the entitled silverspoon kids whose family and neighborhood advantages have already secured their futures (like, um, Carly F. '76), I would be even happier. 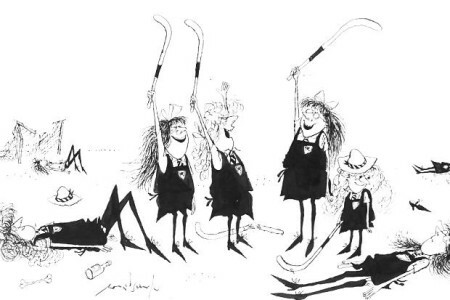 St Trinian's are expected to beat Roedean without the ambulance actually having to drive on to the pitch. Trump may not fade because of his incompetence, or because he is a loudmouth bully and braggart who will go too far and say something too patently absurd and offensive. Maybe it will be with him as Victor Hugo said of Napoleon: God became bored with him. Of all the reasons I have heard cited about why Trump will fade, I find this the most believable. Not sure Trump can say anything sufficiently absurd or offensive once the primaries move to the March 1 superprimary throughout the South. It's a good thing VW used concentration camp labor or this would be the worst thing they've done.